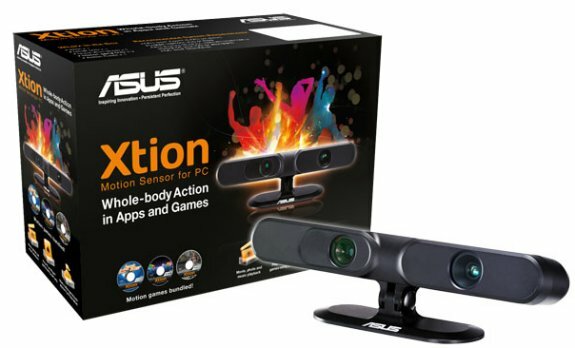 The ASUS Xtion motion sensor brings consumers the first ever whole-body gesture input developed exclusively for PC. It employs sophisticated sensors for precise yet intuitive motion controls, with a user-friendly interface that enables fun and truly interactive gaming, multimedia, and online experiences. Several high profile games offer full Xtion support, with more being added. The dedicated Xtion Store further contains a variety of exclusive games and applications, plus consumers receive a free three-game bundle with their purchase. Xtion works with any PC via USB, making it readily accessible to all desktop, notebook, and ultrabook users. With the focus being on a completely intuitive experience, Xtion supports easy push, wave, and tap gestures to allow for quick access to motion-based games as well as movies, multimedia collections, photo galleries, and web browsers. The simplicity of Xtion usage makes it a fun and convenient interface for all age groups, with easy navigation and large on-screen icons for added clarity. Custom-designed Facebook, Picasa, and Flickr Xtion applications make social networking and content sharing more exciting and personal with whole-body interaction. Xtion also includes a dedicated YouTube application that uses motion sensing controls. ASUS has teamed up with Hillcrest Labs to bring the Kylo Browser to Xtion. The gesture-based browser includes direct links to over 30 popular sites, and users can quickly input text via a virtual on-screen keyboard. It also allows all compatible web content to be zoomed in and out instantly as well as rotated with natural gesture input. Various PC games offer Xtion compatibility. With whole-body active input, gaming becomes more exciting, allowing for greater involvement and cooperation with other players. The intuitive design of Xtion makes for an excellent local multiplayer experience, as users immerse in games with family members and friends. No additional hardware or controllers are required, and the list of compatible games continues to grow, covering several major franchises. These include SEGA’s Virtua Tennis™ 4, EA’s Need for Speed: Hot Pursuit, Street Fighter® 4 by Capcom, Fruit Ninja by Halfbrick Studios, and Rovio’s world-famous Angry Birds™. Xtion users get more content with the Xtion Store, which delivers a wide selection of items. Integrated directly into the Xtion user interface and co-developed with appside, the store features a growing range of entertainment offerings, with games and applications designed to make the most of whole-body interaction on PC. In addition to action gaming, content covers fitness, dance simulators, and sports titles. The Xtion Store will continue to add new items regularly to offer consumers more choice. Xtion comes with a special free bundle that includes three exclusive games developed especially for the new product. Beatbooster and DanceWall offer fun racing and highly active dance action, both with multiplayer support. MayaFit brings a personal fitness trainer to the living room through whole-body exercise routines, detailed progress tracking, customizable training regimens, and much more.